God + Running = Spiritual Revelation. Sweat on the small of my back, breath falling into rhythm, shoes pounding the pavement- God always shows up when I go for a run. He tells me stories of His love, reminds me of His presence, and often calls me to obedience in seemingly kooky ways. My last run was no exception. I ran my normal path, ears void of headphones. I knew He wanted to tell me something. I could sense the urgency in my heart to “listen” so music would only feel like noise. At the fork in the path, He guided me towards a familiar bridge. I felt a pull to discover what lay beneath the steel structure. An area on the bank of the creek caught my eye and I slowly worked my way over slippery rocks to reach it. My shoes slid on muddy walls as I grasped large roots protruding from the fallen trees that cross-hatched the creek. Satisfied I made the trek without falling in the water, I stood taking in the scenery. Interesting, but not out of my realm of thinking. My son loves rocks, so I was game! My eyes scanned the ground, scouring the small rocks littering the mud just below the water. Nothing outstanding or out-of-the-ordinary. As I looked further down the creek bed, I saw a much larger rock. Fine, God. Fine. You know I’m gonna look like a lunatic running down the path, right? Wait, I mean WALKING, because there is no way I can RUN with a boulder in my hand! Silly rock. This better be worth it! I knew it was for me. Bigger than I think I can handle. This new faith is too big to hide from others. My prayers are louder, my passion more abundant, my influence from the world around me quickly lessening. The words He gives me to teach get jumbled and I cry uncontrollably telling stories of what He has done. I stand out from the crowd as I drop to my face in worship or arms lifted in surrender. I sweat buckets when praying healing over a friend and I can no longer hold my tongue when God reveals a truth. There is nothing “pretty” about this BIG. This BIG is overwhelming. But He is showing me His provision in it all. Our God is wild and scandalous and I want to reflect nothing less. 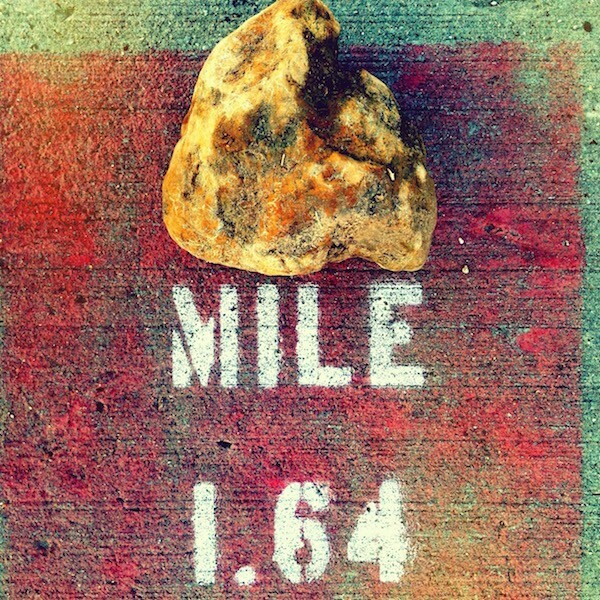 I stood with the rock in my hand as He asked me to to run. As I picked up the pace, He showed me I could indeed run while carrying this rock. Was it awkward? Yes. Did people stare at me with confusion when I passed by? Some, yes. My faith prior to this month has been a palm-sized rock. It was small, smooth, and easy to carry. I could run with it in my hand and no one else could see it if I chose to enclose my fingers around it. 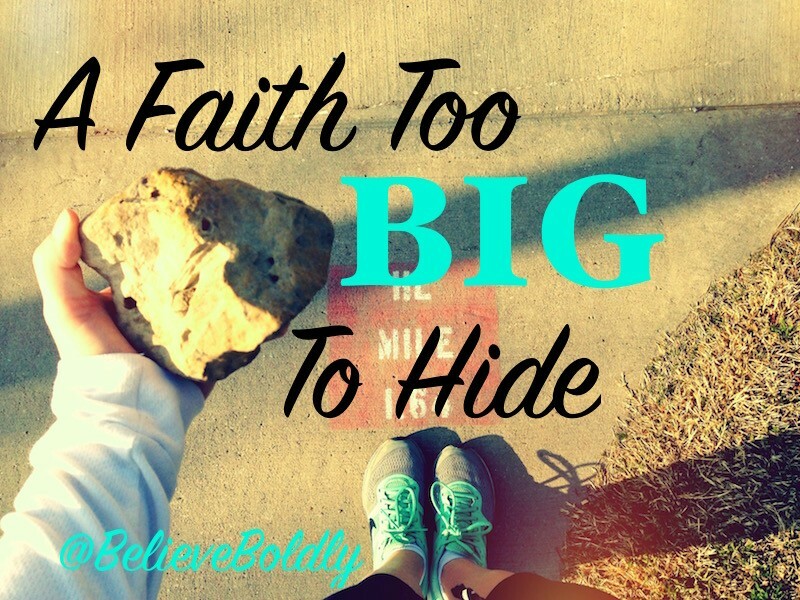 I can still run with this BIG faith, even though it is too big to hide in my palm. People will see my worship and obedience to God and react differently- some will smile, encouraged by my faith and what God has been doing in me; others are going to observe this new movement and think I am flat crazy. The truth is I am serving a God who has done miraculous things through these feeble hands of mine, and I cannot keep living as if God created me to be convenient, unobtrusive and pretty. What if you decide today to surrender what little faith you have for something too big to contain? A spiritual awakening that can’t be hidden? Let go of all your worries about what people think, how you will look running with this gigantic faith, and the fact that you cannot make it happen on your own. Just give in. Ask God to awaken a BIG faith in your heart. Wow! Just wow! It is undeniable to me, this very morning what I have been grappling with these last few days that this message was intended for me to hear today. Thank you for sharing your heart and your journey, Erica. And for allowing God to speak to you and through you. This year God is asking me to dig deeper into my faith, into my marriage, into my relationships and my business. I am praying for His strength to guide me along the way as He stretches me way way out of my comfort zone and into a deeper connection and reliance on Him. Do it! Dig deeper! It has been amazing. Completely out of my comfort zone, but mind-blowing! I Love your BIG faith. So encouraging and the push I needed. Amen Erica! So where is the rock now? As I was told yesterday, our passions protrude and are outwardly visible to others. I too have “awakened” this year in my faith and can absolutely relate! Thank you for your words (which surely come from God). So thrilled to watch all that HE is accomplishing in you. The rock is on my son’s fireplace as of right now! Thanks for the encouragement! Oh my goodness!! Simply glorious. God takes our not so pretty and makes it beautiful far beyond our dreams! This happens to be one of my favorite posts to date. I feel I have been pulled into this journey with you starting from that Sunday! I still hear those 2 incredible words “deeper awakening” so sweetly on a daily basis. God is carrying me far deeper and like you my prayer time has been significantly impacted! ? ?